The eAccess+ network aims to bridge the widening gap between the potential of ICT/AT and eAccessibility for people with disabilities and the ageing population on the one hand and the actual implementation of eAccesibility on the other hand. eAccess+ is driven by 25 core members, coming from all over Europe. It is their task to involve all stakeholder groups at national level and to expand the network by developing a group of so called “Associated Partners”. 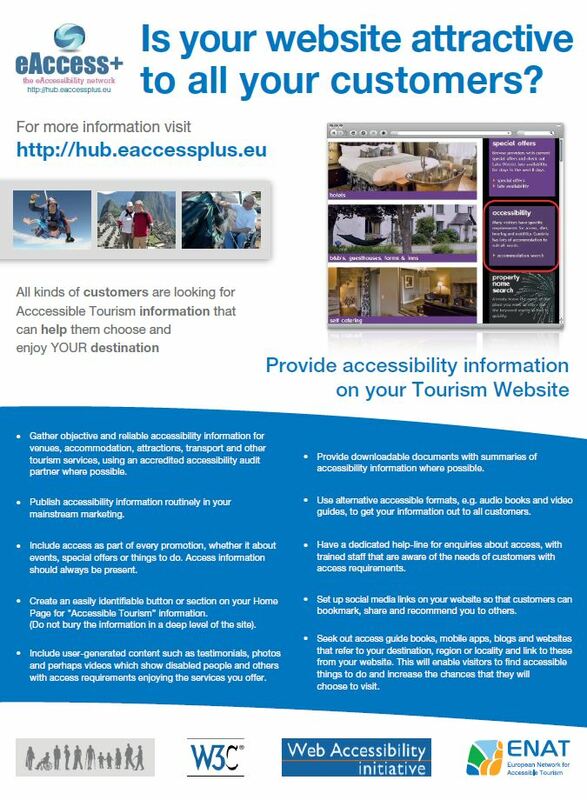 ENAT - the European Network for Accessible Tourism non-profit association is a founding member of the eAccess+ network. 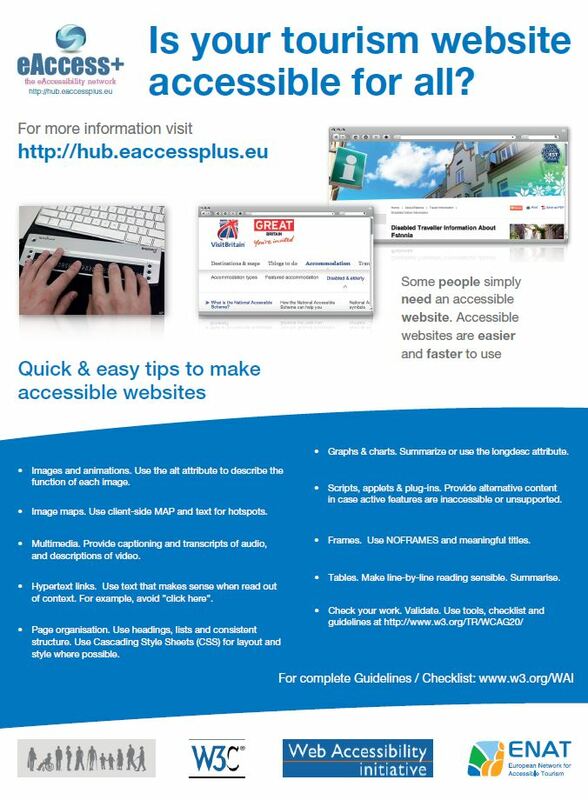 Visit the eAccess+ HUB for answers to all your eAccess needs! The eACCESS+ Network - Making New Technologies Accessible for All. The eACCESS+ network is a new European Union funded initiative which aims to overcome the widening gap between the potential of ICTs / Assistive Technologies and eAccessibility for people with disabilities and the ageing population and the actual implementation of eAccessibility in practice. Much expertise, guidelines, policy, and tools on eAccessibility and the provision of inclusive production and consumption environments, processes and technologies already exists. However, each has its own, highly specific field of application and not all business sectors are benefitting from the knowledge and experience that has been gained. In addition, access demands need to be addressed as technologies are developed. eACCESS+ casts a wide net over all relevant stakeholders (end users, policy makers, administration, industry, service providers for end users, research, education) and will address guideline and standard development, political and legal aspects, professional support of public service provision and private product/business development. The eACCESS+ approach will provide an on-line "eAccessibility HUB" which links to and gives guidance on how to make the best use of existing resources and to outline where resources are missing. A considerable body of knowledge exists and eAccess+ will provide guidance on how to use this in practice by facilitating co-operation between stakeholders. Self-service terminals (SSTs) and mobile devices for banking and financial services, public transport, tourism and cultural heritage. 'eAccessibility' aims to ensure that everyone is included and is able to use e-Services. By establishing the new eAccess+ network ENAT wants to support the opportunity to eliminate barriers for tourists with a disability to participate and use tourism facilities. ENAT focuses on the accessibility and usability of various Information and Communications Technologies (ICTs) in the tourism sector. These include Self Service Terminals (SST’s), electronic devices and Web sites. Tourists with a disability face problems with SST’s such as ticketing machines and information kiosks, but also with joining museums tours, booking accommodations and attractions, and using the Internet. Online booking systems are often hard to use and the rare alternative booking systems are often complicated and discriminating. There are already solutions to many of these technical problems but those who work in the sector may not be aware of the difficulties or how to solve them. As a lead partner of the eAccess+ project, ENAT will encourage the tourism industry to increase the use of accessible SST’s and accessible websites, ENAT is committed to informing its members about the eAccess+ project and stimulating them to support the network and join the so-called “HUB”, where they will find further information. As such, potential ENAT members and stakeholders can communicate with other stakeholders within the network to realise web accessibility and accessibility of SST’s. Undoubtedly, tourism and travel revenues will come to depend more and more on addressing the accessibility of services, as the market of senior and disabled visitors grows in the coming decades. And visit the HUB for answers to all your eAccess needs and questions. eAccess+ Flyer both items in PDF format, from the right-hand panel. 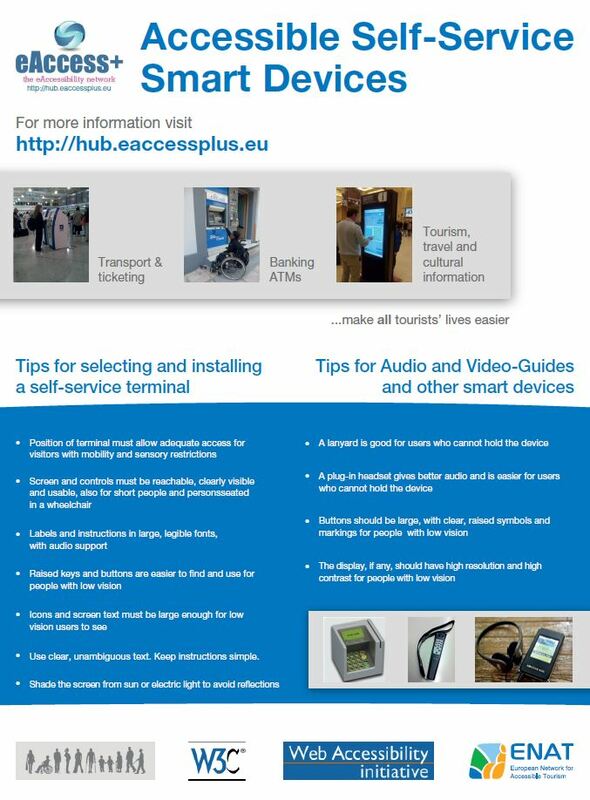 These posters, with tips and advice about accessible websites, accessibility information and smart devices for tourism, can be downloaded in PDF format from the right-hand panel. Larger PDF files, suitable for printing the posters up to size 80 cm x 60 cm are available on request from ENAT. eAccess+ is a thematic network funded under the EU Seventh Framework Programme, ICT PSP third call for proposals 2009:CIP-ICT-PSP-2009-3 Project Number: 250568. Login so that you can add your own comments.